Korallen-Zucht produces a wide range of additive products formulated for both general application and targeted color refining. Each of these additives has been tested and formulated by the most qualified labs and uses only the highest grade ingredients. Through countless hours of research and observation, Korallen-Zucht™ has formulated an assortment of supplements and coral foods to both foster improved growth and promote increased vigor. 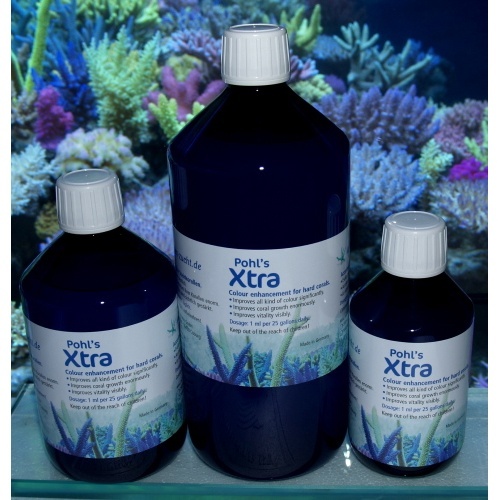 Pohl's Xtra is designed to enhance the coloration and growth corals. It can promote increased color depth and phosphorus/fluorescent tints. Pohl's Xtra can be utilized for systems with hard, soft and/or LPS corals.